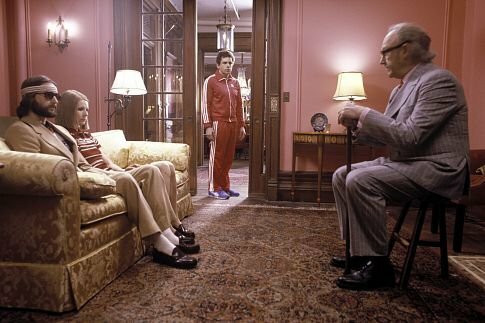 The Royal Tenenbaums is a comedy of reactions more than it is of large events. Most of the conflict has already happened off-screen, and the film’s large cast of characters mostly operate within the film’s narrative arc as individuals full of resentment and regret for each other. It all starts with the neglectful, condescending father figure, Royal Tenenbaum (Gene Hackman). He abandoned his wife (Anjelica Huston) and three children (Ben Stiller, Gwyneth Paltrow, and Luke Wilson) years ago, and has since been forcefully forgotten by the lot of them. Royal decides to return to the family estate after he figures out he’s broke. His family of geniuses (all of them are published, wealthy, and discontent) is mixed about whether to accept him back in, even when he tells them he has cancer (he doesn’t.) It’s a fairly common story, one where we follow the family through a series of events in which they are cosmically (or narratively) forced under the same roof in order to watch the sparks fly. Or that would be the case, if the director were a maximalist instead of a minimalist. Anderson’s low-key comedy is largely character-driven. He weaves jokes almost equally out of situations and dialogue. 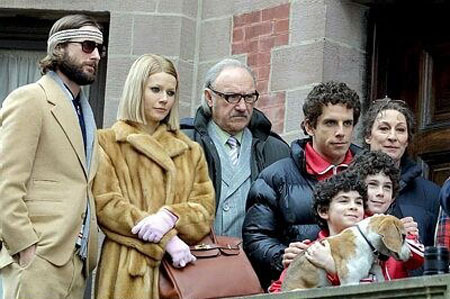 Tenenbaums is a funny movie, but it’s also quite sad. It induces the kind of laughter that comes from human cruelty played off as a joke. You can’t help but laugh when Chas (Stiller) enters the room where his father is bed-ridden and asks in total deadpan for him to get out of the house. Sometimes Anderson has the bad habit of letting his aesthetic obsession get in the way of his storytelling. The Royal Tenenbaums has these moments, with a few of the family gatherings being redundant and not really developing anything. Despite lingering too long on the fake illness or the wife’s love affair, this is a sharp commentary on upper class American life. The Tenenbaums are crippled from the inside-out, unable to live in the world because they are unable to live with each other. You get a sense that you’re witnessing the beginning of the end for all of them. Anderson has always had a gift with finding the perfect actors for his different types of comedy. Hackman is terrific as the desperate patriarch, and Anjelica Huston is equally regal and spiteful as his abandoned wife. Paltrow, Stiller, and the Wilsons (Luke and Owen) are all great as well. The background noise of various lovers (Danny Glover, Bill Murray) were necessary to the plot, but that’s about it. As the movie moves from one sad, prettily arranged frame to another, Anderson’s style gives way to substance. Royal, in his fruitless attempts to patch the gigantic potholes in his familial relationships, is barely able to fix anything. There is no relief for him, and barely any for the generation he helped produce. He gave his children everything but love, and then it was too late. This entry was posted in Reviews and tagged Anjelica Huston, Ben Stiller, Bill Murray, Danny Glover, Gwyneth Paltrow, Independent Films, Indie Cinema, Indie comedy, Indie movies, Luke Wilson, Owen Wilson, The Royal Tenenbaums, Wes Anderson by matterspamer. Bookmark the permalink.